In December 2013, the NuVasive Spine Foundation™ (NSF) completed its final direct mission trip of the year to Kenyatta National Hospital (KNH) in Nairobi, Kenya. 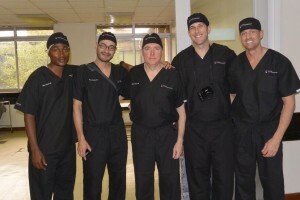 (Left to Right) Pitchou Malaba, Dr. Acosta, Dr. Harper, Dave Wells, and Caleb Granger. Africa with exceeding expectations by treating more than 80 patients at KNH. The NSF would like to extend a BIG thank you to the December surgical mission team which included: Dr. Harper, Dr. Acosta, Coalition Spine Specialist Dave Wells, and NuVasive® Area Business Manager Caleb Granger, for their time and generosity.